We've had a week away, staying in the delightful Cornish town of Fowey (pronounced Foy). The apartment we rent is part of an old boathouse, perched right on the river, so it's excellent for watching all the comings and goings. 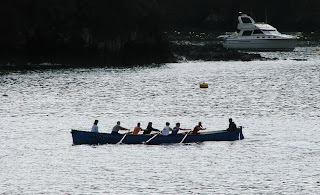 Gig racing is very popular in Cornwall, the boats are based on a Cornish Pilot Gig, rowed with six oars, they are 32 feet long and 4 feet beam. Originally a work boat, used for taking pilots out to meet incoming ships, they were designed for speed and the rough conditions of the western approaches. 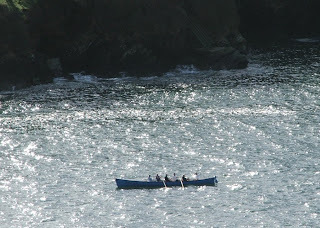 In recent years there has been a resurgence of interest in rowing these boats, with new boats being built to a design based on the 1838 gig "Treffry", which is still actively rowed by the Newquay Rowing Club. Today the Cornish Pilot Gig Association has over 55 member clubs and more than 140 boats participating in events all around the west country. Below the Fowey ladies crew make their way up river, past Pill Creek in the early evening twilight. 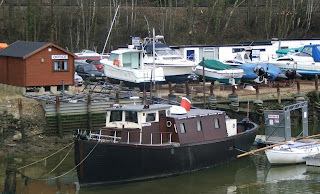 The Cabin Boatyard is tucked away behind the Chinese Restaurant on the Southampton side of Bursledon bridge. As you can see from the office building, the yard is well named. What I like is the eclectic mix of boats like this motorboat with what I assume is a mock steamer funnel. Alongside is a very sweet wooden sloop, I don't know much about her, but she is a really nice looking little boat, which is sadly in need of a little tlc. 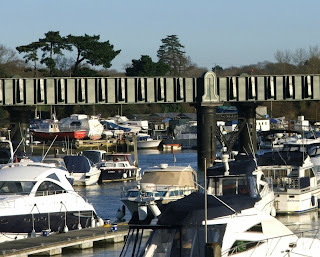 The Cabin Boatyard fronts one of the most crowded stretches of the river between Bursledon bridge and the railway bridge a few hundred yards up river. It marks the upper limit of the river for yachts, which aren't able to get under the low bridge. 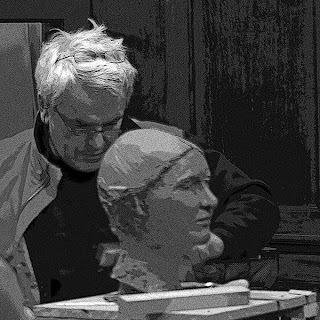 While Bursledon may be short on local shops (see my post The Butcher, The Baker) we do have a very fine sculptor and carver of ships figureheads - Glyn Foulkes. Glyn is well know locally for his rowing and sculling skills, his is usually the boat to beat in the Bursledon Regatta. 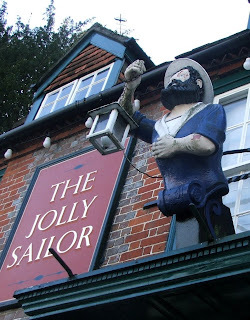 I only recently found out that Glyn had carved the figurehead outside my favourite pub, the Jolly Sailor, in fact I found out from a post on Musings from a Muddy Island where Juliette had spotted Glyn working on a figurehead of Lord Nelson at the London Boat Show. Have a look at Glyn's web site where there are some fine examples of his work, I especially like the Leopard wind vane he did for Sackville College. Down in Hamble the cafe on the quay normally opens at Easter after it's regular winter closure, but this year we're going to have to wait a while for our favourite weekend breakfast venue. The old cafe had open air seating right down on the quay, it was a great place to watch the comings and goings on the river with a tasty bacon sandwich and steaming cup of tea. 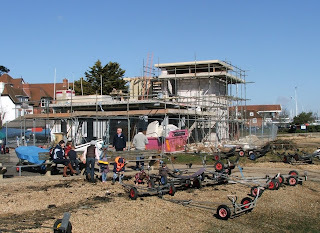 This year things are a bit different, the old cafe has been demolished and a brand new purpose built cafe is being built. The finished building will have an outside decking area as well as a roof top terrace. Best of all the indoor seating area will allow the cafe to open all year round. We're looking forward to the grand opening around May time. Sure enough, if you Google “HMS Aries” > images, the second picture that comes up shows three sailors, the one at the back at the left with his hat tilted back is my Dad. The picture was posted as part of a family history which featured John Taylor (right). Clearly they were friends, but sadly both John and my Dad died some years ago so I have no more information. HMS Aries was an Algerine Class minesweeper, built in Canada for the war effort. My dad joined the crew around 1943 and like many of his generation didn’t talk much about his experiences. I learned from my mother that a ship he was aboard had hit a mine, killing one of his close friends. This was confirmed as HMS Aries when I spoke with the Algerine association. I also know my Dad was injured while on Aries; after his death I found an MOD “Certificate of Hurts and Wounds”, in his effects, which details how he was injured by anti aircraft fire. I also recall when I was young, my mother showing me his campaign medals, one of which was the Adriatic Star; I believe Aries was involved in minesweeping operations as part of the landings in southern Italy. 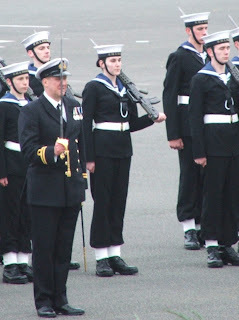 My little girl at her passing out parade, with her - er gun!! Grandad would have been proud. Despite a brisk northerly holding the temperature down, on Sunday morning it looked like spring had finally arrived, with a beautiful blue sky and sunshine. 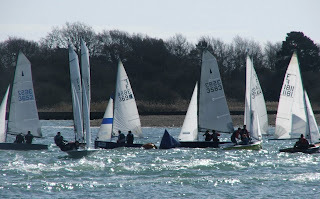 Hamble River Sailing Club host the "Warming Pan" weekend for Merlin Rockets, National 12's, Fireflys and Foxers. 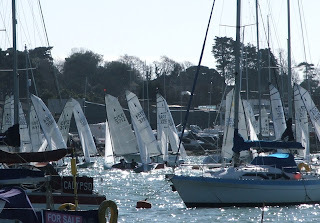 The fleet assembled opposite the HRSC start in the Sunday sunshine, what a great sight. 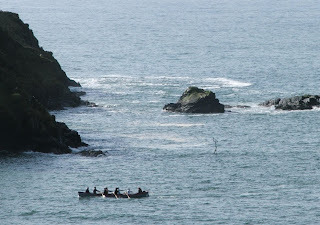 The Merlin Rockets took off up river, spreading out among the moored boats. Before heading down river to the outward mark, down by Hamble Point, you can see a couple of Fireflys mixing it up with the Merlins. 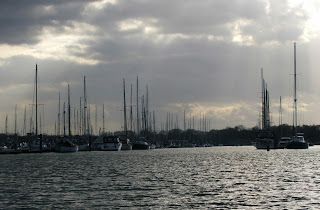 After the racing fleet had shot off up river, all was peaceful, the river rarely looking better. Regular readers will know that rowing is a great way to get out on the water, the simplicity of a rowing boat means you can fit in a couple of hours rowing between all the other busy demands of modern life and it’s great exercise. 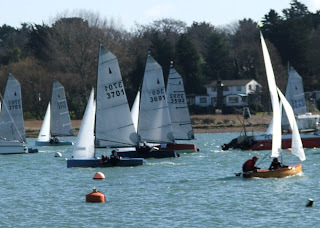 Some good news is that “Hamble River Rowing” is being formed as a club to encourage recreational rowing on the river. The idea for a rowing club has been under discussion for some time and has finally come together with the support of local people and businesses. 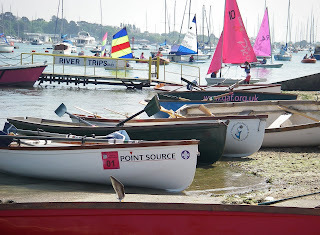 Two members have generously loaned boats - Bursledon Gigs to the new club, they are to be based on the pontoon at the Jolly sailor pub, which together with Brewery Hall and Woodhouse are helping the club get off the ground ; or should that be away from the dock! 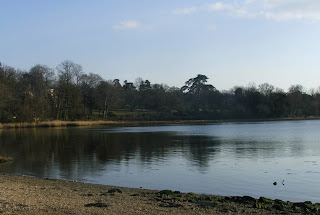 A rowing program includes evening rowing on Tuesday nights during the summer, expedition type rowing at the weekends as well as entering a team for the Hamble River Raid. 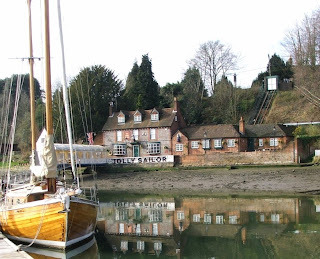 A kick off event when prospective new members can come along and see what it's all about will be held on Saturday 17th April at 11.00 at the Jolly sailor. As well as the two club gigs, other members will be bringing a variety of rowing boats along, and of course I will be bringing Gato Nego along. So there will be plenty to do, for details see the website. Longer term plans are to purchase club boats which members can use either on club nights or for individual rowing. 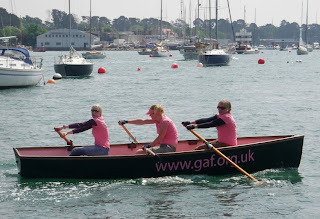 It sounds like a great idea and a low cost way of getting people involved in traditional rowing, so get on down to the Jolly Sailor on 17th April and have a go. What with the snow and working on Greta before she goes back in the water and the seemingly endless wet weather, it's been two months since I've been out on the water. With a high in prospect for the weekend, and with it the promise of fine, if chilly weather, I was determined to get out for a row. Of course it's never that easy, the house was frankly a tip, so I spent a couple of hours cleaning and hoovering (is there no end to this man's talents I hear you ask). Then it was a walk down to the local fish shop to buy some lunch, and of course we kept bumping into people. 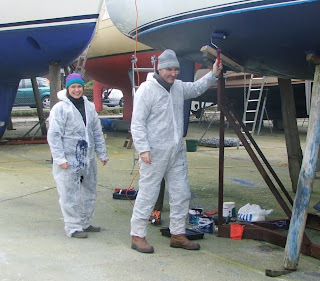 Our first surprise was Tony who had moved to Cornwall a couple of years ago, and was back for a flying visit to do a keel repair on another friend's boat. Just as we were getting away we heard a call from these friends, who were in the middle of anti fouling, the annual ritual of painting the bottom of your boat with nasty and very expensive paint, to prevent barnacles and other marine creatures sticking to the bottom. Forget the latest Musto or Helli Hanson, this is what the best dressed yachtsman and woman are wearing at this time of year. 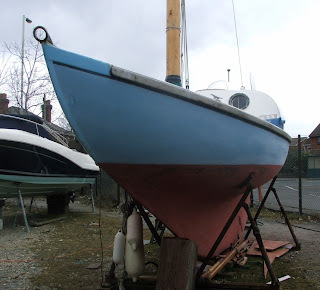 We also stopped by to say hello to Tim and his Folkboat China Blue, about which I wrote last year. Tim is preparing for the Jester Challenge which departs from Plymouth in May this year, a single handed trans Atlantic race. In the event I had a great row, a few muscles reminded me that they had been inactive for too long. As I got back to the slipway at Swanwick hard, the sun came out and the sky had cleared to reveal a beautiful late winter afternoon. Better still Erica phoned to say she had some cookies fresh from the oven. A quick walk home up the hill to a perfect finish with a cup of tea. 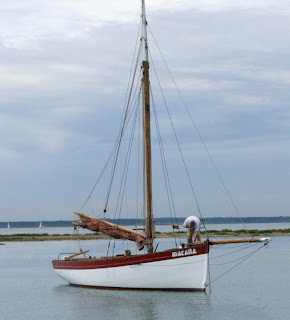 Another boat which I keep seeing around is this lovely gaff cutter - Macalla. 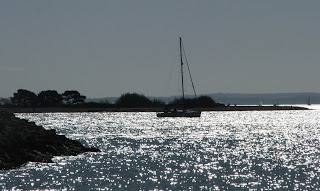 Here she is on a perfect evening in Newtown Creek, an unspolied creek on the Isle of Wight in the western Solent. She’s quite a big boat I’m guessing 32 or 35 feet on deck, with a delightful sheer. Sadly I don’t know anymore about her, but if you do please drop me an email. 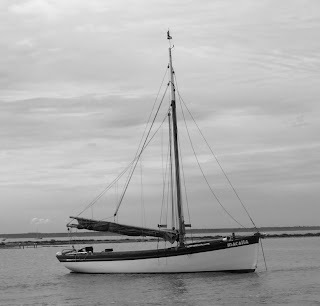 Accommodation might be limited, but it’s easy to see the attraction of a large, fast and beautiful day sailor. A day on the water under a cloud of sail, then back to the yacht club for dinner and home to a comfortable bed – maybe I’m getting old! The pictuere above could be from 50 years ago. 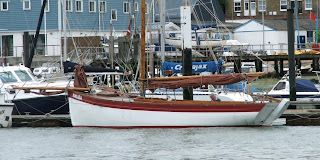 The first time I spotted her was in Cowes, I think on the Royal Thames YC pontoon back in the height of summer. If your idea of fun is coastal racing in a small boat or even a kayak, then Watertribe might be the event for you. The 2010 Watertribe event kicks off on Saturday 6th March, there are three races, all of which are extreme challenge events, described as "the toughest expedition style small boat races in the world" and are not for the faint hearted. The must read warning says it all - "WaterTribe events are dangerous and you must be an expert in your chosen craft before even considering these challenges. There are no safety boats, no safety net, and no excuses. Your safety and well being are up to you and only you." In previous years the start has been from the beach, where competitors have to haul their boat into the water unaided and then sail or paddle a grueling 300 odd kilometers along the Florida coast. Squalls, shallows and nigh time navigation at high speed are all part of the fun. I think it might be a much better reason to visit Florida than going to Disneyland, and it makes some of our European RAIDs seem, well just a little tame. It seems slightly odd that such events are possible in the "Land of Litigation", I'm sure our own health and safely folks would be having a fit! Personally I like the idea that "All WaterTribe events are dangerous events as defined by Florida law and common sense". 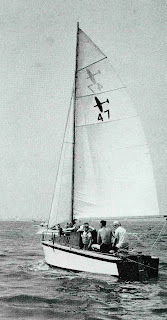 The wartime fighter airplane Spitfire is instantly memorable, but perhaps less well known was the Spitfire yacht, designed by Alan Eckford. “Domesticated dinghy men” were the people Alan had in mind when he designed the lightweight Spitfire. Like his other designs, Spitfire used a resin-bonded mahogany plywood shell, the strength of which was sufficient to make frames unnecessary, although there were a number of longitudinal stringers which stiffen the internal structure. Light weight construction, made the Spitfire a fast boat, “Can be planed, if nerves are good” claimed the designer. One Spitfire raced from Dover to Calais in 3 hours 12 minutes, beating several much larger boats and winning the race overall. Alan was an innovative designer, his Fleetwood dinghy of 1948 was described as the fastest dinghy under £100. He later floated into outdoor legend ... in a caravan , his most usual project was an Amphibious Caravan .Released in 1955 to considerable media attention, the blue and white "Otter" Amphibious Caravan measured five metres by two metres. It was built of marine plywood and could be launched directly onto any inland waterway. Once afloat, it could cruise at four knots, holding up to six passengers; the reinforced roof doubled as a sundeck. A winch was provided with the undercarriage to haul the Otter back onto land. Eckford and his business partner, Ronald Sams, sold about 200 of their amphibious caravan. But this venture was a sideline to the main focus of their company, based at Hoddesdon, Hertfordshire, which was to manufacture small items of sports equipment, such as tennis, squash and badminton racquets, hockey sticks and billiard tables, most of which were manufactured in Jamaica. An original film clip can be viewed here.